Note : PLEASE VERIFY PART NUMBER FITMENT WITH DEALER. Stock location : WH 2 / BOX 24. Check out my other items. Be sure to add me to your favorites list. 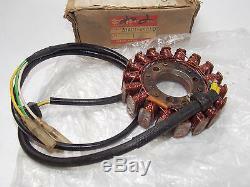 The item "NOS NEW SUZUKI 1978 1979 GS1000 IGNITION GENERATOR STATOR 31401-49010" is in sale since Tuesday, April 07, 2015. This item is in the category "eBay Motors\Parts & Accessories\Motorcycle Parts\Antique, Vintage, Historic". The seller is "parmabike" and is located in Pompano Beach, Florida.